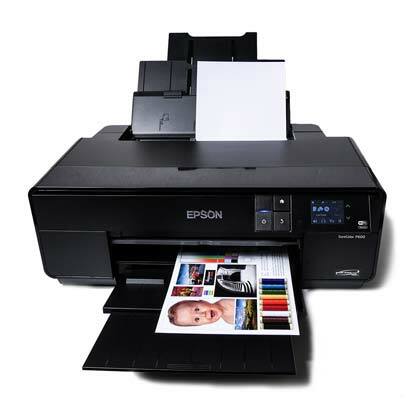 The Epson SureColor SC-P600 A3+ printer is aimed at both the professional and advanced amateur photographer who demand the highest quality photographic prints. The printer uses 9 UltraChrome HD pigment inks which include; Yellow, Vivid Light Magenta, Light Cyan, Vivid Magenta, Cyan, Light Light Black, Light Black, Photo Black and Matte Black. 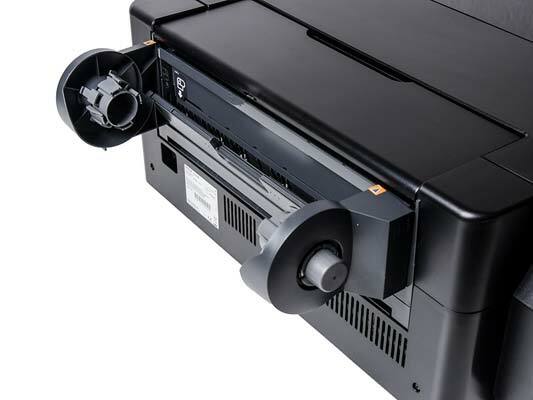 The Epson SureColor SC-P600 costs around £550 / $750. 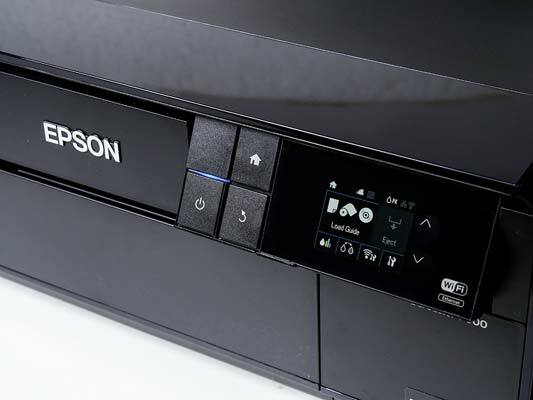 The Epson SureColor SC-P600's upward tilting control panel has a 2.7 inch LCD colour touch screen and three buttons; Power ON/OFF, Home (for the LCD screen), and return to last menu item. There is a blank button which Epson could have used for another function such as Print, Cancel, or user defined. However, all the options are available on the touch screen panel. The LCD menu includes useful information on how to load media, and displays screens of information such as ink levels, WiFi setup, maintenance etc., this saves looking through the PDF user guide. Pressing the OK button expands most of the menus to provide sufficient information on each function. 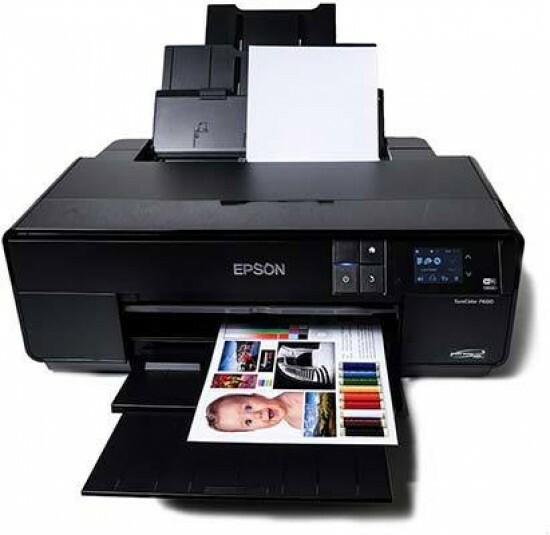 Connect the Epson SureColor SC-P600 to a power source and turn on. The pigment ink cartridges have to be shaken before installing. This is to ensure that the heavier pigment ink particles have not settled at the bottom of the cartridge. The cartridges do not move with the print head, they remain in a fixed position on the left side of the printer. 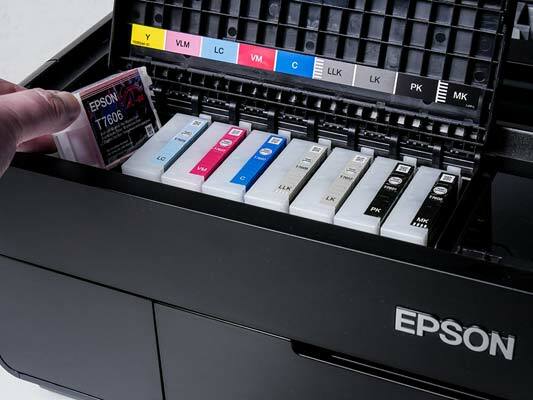 Each ink cartridge has a unique moulding combination which will only fit into the correct, the slots also have a colour label, so there is no possibility of inserting the inks into the wrong chamber. The cartridges contain a generous 25.9ml of ink, not sure why Epson could not have made it a round 26ml. The smallest variable ink droplet size has been reduced to 2.0pl, this produces smoother gradients and reduced grain effect. Although all 9 inks are fitted only 8 inks are used at any one time. The printer automatically switches between Matte and Photo black when the media type is selected in the driver or via the front LCD screen. The amount of ink that is used for the swap is; Matte to Photo Black approx. 3ml of ink, Photo to Matte Black approx 1ml of ink. 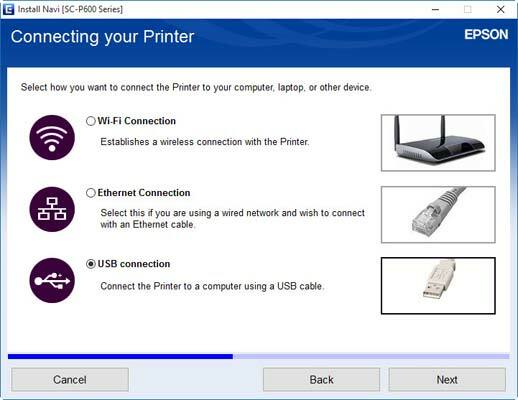 Next, install the printer drivers and software, just follow the on-screen instructions. You have three options for connectivity, a USB 2.0 port, WiFi or 10/100 Ethernet. The bundled software includes Epson Easy Print and a more useful Epson Print CD as well as the PDF User Guide. You have the option to leave out the software when using the custom install setting. 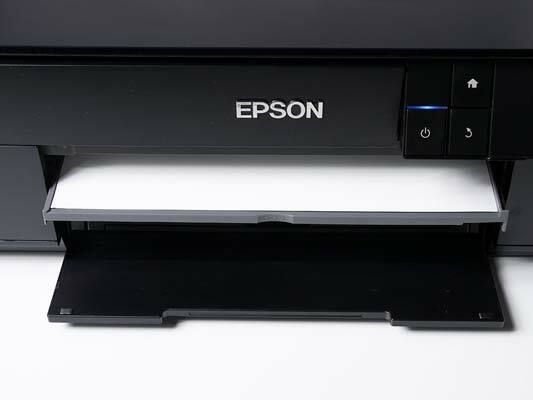 The overall build quality of the Epson SureColor SC-P600 is of a very high standard with sturdy trays that don't give the impression they are going to fall apart with heavy use. The SC-P600 has a small footprint 616‎ x 369 x 228 mm (Width x Depth x Height). The three section rear Auto sheet feeder acts as a protective cover against dust and other objects that could fall into the works when closed. The front paper out tray consists of two telescopic sections, although the tray may seem too small to catch A3+ media. The SC-P600 also has a front loading straight paper path for thicker paper and board up to 1.3mm thickness. When using thick Fine-Art media the media is drawn in and makes 45 degree upward curve to place the paper in the Rear Speciality Media holder ready for printing. This was rather confusing as the most logical method would be to load media into the rear tray. Board media up to 1.3mm can also be loaded, this does keep a straight paper path. The board media is drawn fully into the printer before printing commences, this requires extra clearance at the rear to allow the board to make a partial exit before being drawn back in for printing. 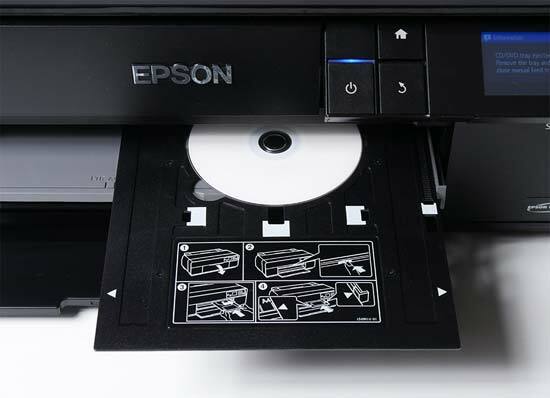 The Epson SureColor SC-P600 also has the ability to print professional quality labels directly onto inkjet printable CD/DVD disks, a useful addition for social photographers who supply wedding image disks and multimedia content. The CD/DVD tray is included with the printer, this slots in the straight paper path tray. For designing labels Epson include Print CD software, this application is basic but nevertheless still useful for producing good looking disc layouts. 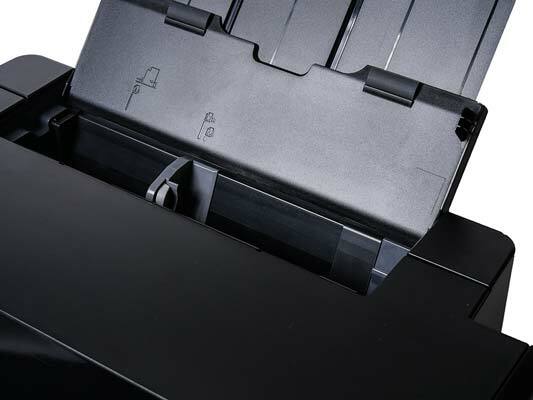 The rear paper support is a three stage telescopic unit which also forms the printer's top cover when closed. The bottom stage has two rubberised pads to stop large format media from slipping. The grey media guide has a positive feel and moves very smoothly along the guide, markings for A4, Letter and A3 media are engraved at the rear. The Speciality media support tray is located at the back of the printer. This tray serves as the printing tray when using the front loading media tray, although media can't be loaded via this tray. See later in this review for a full explanation. 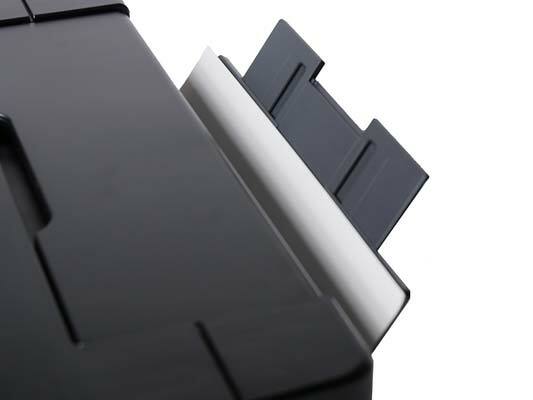 The printer is supplied with two roll media holders, these are attached to the rear of the printer. This will accommodate roll media up to 13inch wide, the orange marks indicate where the holders should be set. Due to the tight curl of this small format, prints can be difficult to un-curl, roll media is probably best left to larger format printers.